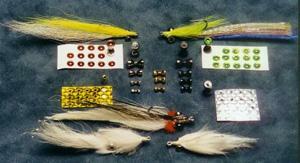 Joe Branham discusses the how's, why's and wherefores of including eyes in your fly tying. According to Joe, "Eyes, not only add cosmetics to the actual but, the general consensus is that by adding eyes to your flies, that the fly will get more takes." Try these different ideas! Eyes play an important part in our fly tying. Eyes, not only add cosmetics to the actual but, the general consensus is that by adding eyes to your flies, that the fly will get more takes. For the most part, in the early years of adding eyes to your flies, they were painted onto the head of the fly and then coated with head cement or a similar material. This was later followed by covering the head and eyes with epoxy and some of the other head coatings. Bead Chain was added to eyes sometime around the mid 1900’s but were seldom painted. They were used primarily as a weight that also served as an actual eye for the fly. Plastic eyes were and continue to be used on flies. These are primarily what are called “Doll Eyes” and are available in various shapes, sizes, colors and have moveable pupils. 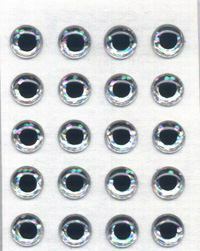 Solid plastic eyes are also used and are available in various sizes and colors. In the 1980’s the lead bar bell eyes were introduced and these too were used as a weight but with the almost flat surface on the ends of the bar bell, painted eyes were added and then coated. The biggest problem with painting on eyes, either on the actual head of the fly or on the ends of the bar bell eyes is that no matter what you coat the eyes with, eventually the coating will chip and the eyes will chip or peel off. Also in the 1980’s several companies had the stick on eyes that were used in the making of lures and some of the tyers started using these on their flies in lieu of painting on the eyes. These are the tape eyes that have gained a lot of popularity in the fly tying world. These eyes added different color schemes and back grounds and created some very good looking and effective flies. As things progressed, several companies developed new eyes that could incorporate not only the stick on tape eyes but the newer molded 3D eyes as well. Primarily Spirit River and Bestco are the ones that developed these products and got them into the public’s eye. These eyes are either molded or machined with a recess in each side to accommodate the stick on eyes. Both Bestco and Spirit River also came out with a line of eyes that had the irises and pupils already made onto the eyes thus eliminating the need to either use the stick on eyes or paint the ends of the eyes. What this means for the fly tyer is that now, they have the choice to use numerous different types of eyes on their flies and can achieve some very dramatic effects with these eyes. It also eliminates the step in tying that requires the tyer to have to paint and coat the eyes on their flies making for a fly that has eyes that will outlast the actual fly. The next evolution was the use of “Cone Heads” in fly tying. These have evolved into some very nice products by both Spirit River and Bestco with numerous sizes of heads and also having recesses for the stick on eyes. While these eyes are somewhat more expensive than the regular bar bell type of eyes, the advantages far outweigh the small extra cost. If you have not seen these eyes or want the actual specifications, you may visit the following web sites- www.eyesforflies.com – This is Stu Dickens’ Bestco Web site and you can see his full line of products. You can order through his site or ask your local fly tackle dealer to order them for you. www.spiritriverinc.com is Bill Black’s web site and Spirit River will shortly have their complete product line available for viewing. Spirit River only sells to dealers so you will have to have your local fly shop order them for you if they do not carry them. Below is a photo, description and company info for each of the various types of eyes where applicable. These eyes are made of solid plastic with non moveable pupils. 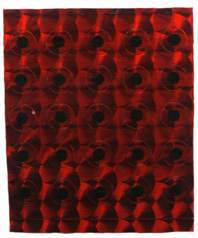 They are available in numerous sizes and colors. One example of a moveable pupil eye with a large pupil. Available in various sizes and colors. Another example of a moveable pupil plastic eye would be the ones with a small black plastic ball as the pupil. These are stick on tape eyes. They have either a solid iris with a pupil available in numerous colors or a prismatic iris with a pupil in numerous colors. The eyes are sized in millimeters from 1.5 to 12mm. Conversion table: 1.5 = 3/32, 2.0 = 1/8, 2.5 = 5/32, 3 = 3/16, 3.5 = 7/32, 4 = 9/32, 4.5 = 9/32, 5 = 5/16, 6 = 3/8, 6.5 = 11/32, 7 = 7/16, 8 = ½, 10 = 5/8, 12 = ¾. These eyes can be used by themselves or with any of the eyes that allow for the use of the stick on eyes. If you use these on any of the eyes that have a recess for the tape eyes, make sure that your tape eyes are slightly smaller than the actual diameter of the eye to ensure that the tape eye fits into the recess. These are stick on 3D Molded Eyes to give a more realistic appearance. These eyes may be used by themselves or with any of the eyes that accept tape or 3D eyes. These eyes are sized in millimeters from 1.5 to 12mm. See tape eyes for conversion. The "Epoxyed Eyes" contain no lead, nickel, chromium, or zinc and a natural tumble finish gives them a bright patina. This allows them to maintain a bright finish with an extended shelf life. This is accomplished without the use of toxic plating chemical. The eye is finished in a space age polymer epoxy which like wise contains no Mercury, Lead, Zinc, or any other harmful chemical. 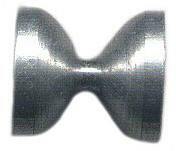 They are available in five (5) sizes: 1/8th, 5/32nds, 3/16ths, 7/32nds, and 1/4 inch. Colors available are; (1) Yellow / Black pupil, (2) Pearl / Black pupil, and (3) Clouser Red / Black pupil. A stringent quality control program will maintain size and finish integrity throughout the production of these eyes. That means that a size # 3 (1/8th inch ) produced this year will be identical to those produced next year. Real Eyes Plus have an enamel iris/pupil installed from the manufacturer and guaranteed to never pop out. Gold eyes have chartreuse irises and the nickel has a yellow or red iris. Colors: Gold, Nickel. Sizes: 5/32, 3/16, 7/32. Machined from solid brass in the same bar bell shape but with a recessed pocket on each side to accommodate either the tape or molded 3D stick on eyes. Colors: gold, nickel, black nickel. Sizes: 5/32 takes 1.5 eyes, 3/16 takes 2.0 eyes, 7/32 takes 2.5 eyes, ¼ takes 3.5 eyes. We had developed this type eye about the same time as another company introduced a very similar eye in brass. We are currently producing them in lead to satisfy those who find the other eyes to light to turn over the fly properly. It is hour glass shaped with the blunt end cupped to receive the new stick-on eyes. And will be available in five sizes to match eyes similar to sizes 1½, 2, 2½ , 3, and 3½ of Witchcraft stick-on eyes. By adding a small dab of epoxy, the result is an attractive addition to the fly tiers art. They are available in the above standard sizes and are available plated in Silver, Gold, and Black. Standard lead bar bell eyes. Nickel only. Sizes: 5/32, 3/16, 7/32. Size availability is as follows: 3132nds, 118th, 5132nds, 3116ths, 7132nds and 114 of an inch. The 3132nds of an inch allows for use on small saltwater flies as well as some freshwater patterns. These eyes are available in natural lead finish, sparkling silver plate, a bright gold plate, as well as a lustrous black. Cones heads have been around for quite a while but have just started gaining popularity in fly tying in recent years. Originally only available as a cone shaped head with no recess for the stick on eyes. These are still available but the following are gaining more popularity as they have a recess to accommodate the stick on eyes or have an eye incorporated into the actual head. Cone head that is drilled to accommodate the stick on eyes. Available Sizes; X- Small, Small. Medium, Large and X-Large ** With the advise and assistance of Bob Popovics we have made an adaptation of our popular lead "Fly Heads" to fill a specialized need. The new "Jiggy Head" is designed with the same aerodynamic in form and function of the "Fly Head" in lead. While allowing a controlled rapid sinking of the fly and encompassing the use of the popular "Stick-On Eyes" to create a more attractive fly. It is to this end that the "Jiggy Head " has been developed. 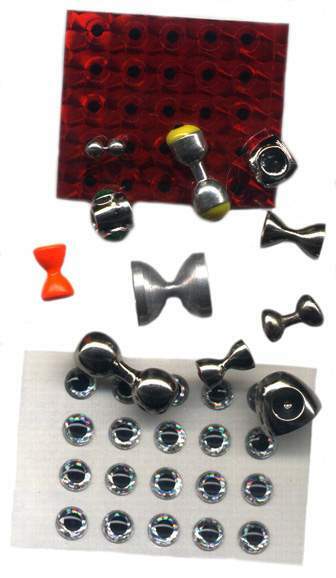 They are made in five sizes and is designed for hook sizes from size 4 to size 4/0. The finishes that are available are Bright gold, silver, and a high luster black. The piece sizes and matching usable eye sizes are as follows: X-Small - size 1½ ; Small - size 2 ; Medium - size 2½ ; Large - size 3 ; X-Large - size 3. Available in sizes X-Small, Small, Medium, Large, & X-Large This new adaptation of the "Jiggy Head" is designed to take advantage of the sparkling eyes found on the Krystal Dumbbell Eyes. Finished in a highly lustrous silver finish with Gold, Green, Pearl, and Red sparkling eyes with a black dot. They are made in the same five sizes as the Jiggy Heads they are modeled on. They are designed to fit hook sizes from 4 to 4/0. In adding these we hope to add to the available options of innovative flitters. Spirit River and Bestco have various other cone head types of products available but I have omitted them as I wanted only the ones that could be used with the tape eyes or were manufactured with the eye incorporated into the head. Visit the applicable web site to view their other products. As you can see, eyes have come a long way since paint and the plastic doll eyes were about the only way to put eyes on your flies. Stu Dickens, owner of Bestco, continues to be a very innovative person, as his products show, and he will continue to develop new and better products for fly tying. Bill Black and Spirit River continue to be one of, if not the, leading wholesaler of fly tying materials that continues to have new and innovative products for the fly tyer. Just a quick note for those of you interested in “Production Tying”. By using the pre made and/or pre painted eyes, you will eliminate one or more steps in the tying of your flies. The amount of time that you will save will far outweigh the small additional cost of these eyes and the eyes will be almost indestructible. Be innovative, try new things and enjoy your tying.